There has got to be a better way to make sales presentations. 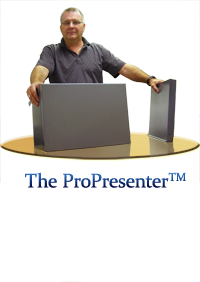 When it comes to sales presentation stories, we here at ProProducts™ have heard a whopper! One respectable saleswoman told us her boss recommended the following: take a midsize copier-paper box to your sales presentation, set it on the table, and … drape a white sheet over it. Voila, a podium. In such cases, it is customary to refrain from poking fun at one’s boss if such a suggestion is made. But of course, this saleswoman was laughing when telling this story because a white sheet in most cases is not the best presentation tool, and she knew it. After she shared this with us, she then told her boss about our ProPresenter™ product! Any presentation, is about communicating your core message. The method of delivery effects how your audience receives the message itself How you say something is about as important—sometimes more important—than what you say. Tone, inflection, body language, props, dress, and vocabulary send signals about your identity. One of the ways you can rise to your best genuine appearance is to use props that undergird your message with professionalism. Our podiums can be customized to your heart’s content! You can put your designs on them, change their colors, and even place gold plated logos on the front. 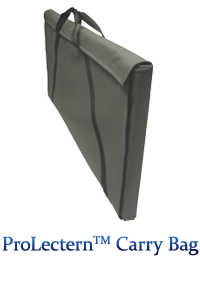 If you feel a good prop might help your presentation, check out the ProProducts™ below!